Let’s install chat on your Android phone. We'll use AndroIRC in this tutorial. 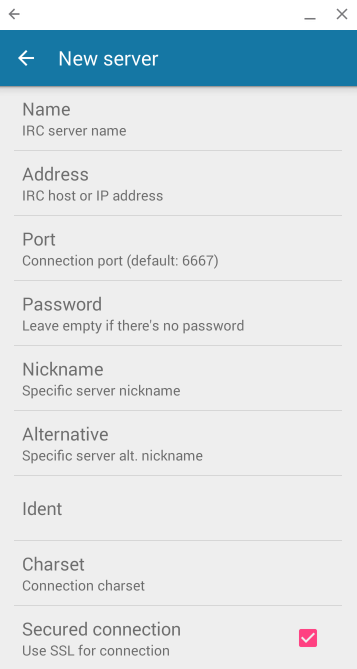 You can install AndroIRC from Google Play Store. Once you've installed the app, click on the settings icon and select settings. Select Servers and then again select settings and select New server. You can set the Name to whatever you want. The address is the Host name from the credentials. The Port is the port from the credentials. You can leave Alternative blank or enter a slightly modified version of your Nickname, as it's just for the case that someone else the same nickname as you. Ident is the User name from the credentials. Make sure that Secured connection is checked. Ignore the rest of the fields and select the Back icon. Go back to the home screen and select the Plus sign to add your new server. Select it from the list and connect. You'll automatically join the chat room.